Charlottetown MP Shawn Murphy received a reply from the Canada Lands Corporation (the Crown Corporation which presently owns the Upton Farmlands) in response to his letter requesting an 18-month moratorium on development of the lands. As you can see, CLC is making no promises to anyone, and we must keep up the hard work. We are sincerely grateful to MP Murphy for his efforts in Ottawa to save this land for the good of the environment and for the health of his constituents on the Island. 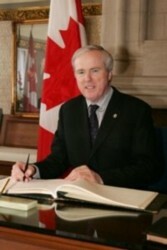 The Honourable Shawn Murphy, P.C., M.P. I am writing to respond to your letter of April 11, 2007, which was sent to the Honourable Lawrence Cannon, the Minister of Transportation, Infrastructure and Communities, and then referred to me. Your letter was on the future of the Upton Farm project in Prince Edward Island. In it, you requested an 18-month moratorium on development at Upton Farm and the creation of a task force with federal, provincial and municipal representatives to discuss future development on the property. As you may be aware, 60 acres of the approximately 250-acre site have received municipal approval for development. Canada Lands Company is, however, aware of the concerns raised by several stakeholders and is currently assessing its plans regarding the site. Thank you for your interest in this project and Canada Lands Company. c.c. The Honourable Lawrence Cannon, P.C., M.P. This entry was posted on July 16, 2007 at 7:27 pm and is filed under Canada Lands Company, Support from Local Politicians. You can follow any responses to this entry through the RSS 2.0 feed. You can leave a response, or trackback from your own site.